Units come complete with keyboard, mouse & power supply. Need to sell your Thin Clients? Order any of our Wyse Thin Clients online or call us at 1-800-457-8499 or e-mail us. Your purchase order, with credit approval, is welcome, as well as all major credit cards, Paypal & Google Checkout. Vecmar offers a wide selection of secure, reliable, cost-effective Dell Wyse Thin Clients and cloud computing devices designed to integrate into any virtualized or web-based infrastructure while meeting the budget and performance requirements for any application. Dell Wyse thin and zero clients offer an array of high-performance features designed to be flexible, scalable and safe, all while integrating seamlessly with your work environment, whether you're in the office or in the cloud. Vecmar also supports a variety of different setup options for Dell Wyse zero and thin client devices depending on your needs. We can install custom images and device drivers as well as setup specific broker configurations, display parameters or other settings to help with your thin client or zero client deployments - FREE OF CHARGE. 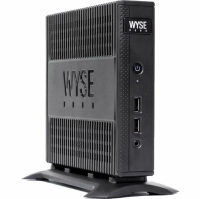 Wyse Thin Client Prices are based on current stock and are subject to change.